Exquisite patterns emerge from salt scattered on a metal plate which is stroked with a bass fiddle bow, illustrating two dimensional vibration. A video camera will enlarge the patterns for the class to see in the Knudsen lecture halls. 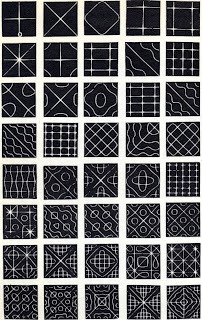 Chladni patterns published by John Tyndall in 1869. Chladni patterns can also be formed by using circular or rectangular metal plates on a mechanical driver controlled by a signal generator. This method avoids having to practice your bowing. The patterns are now different since they have antinodes at the center (which is being vibrated) rather than nodes with the center rigidly attached and the edge bowed.